I’ve never seen a blonde 68 335 with a maple neck. 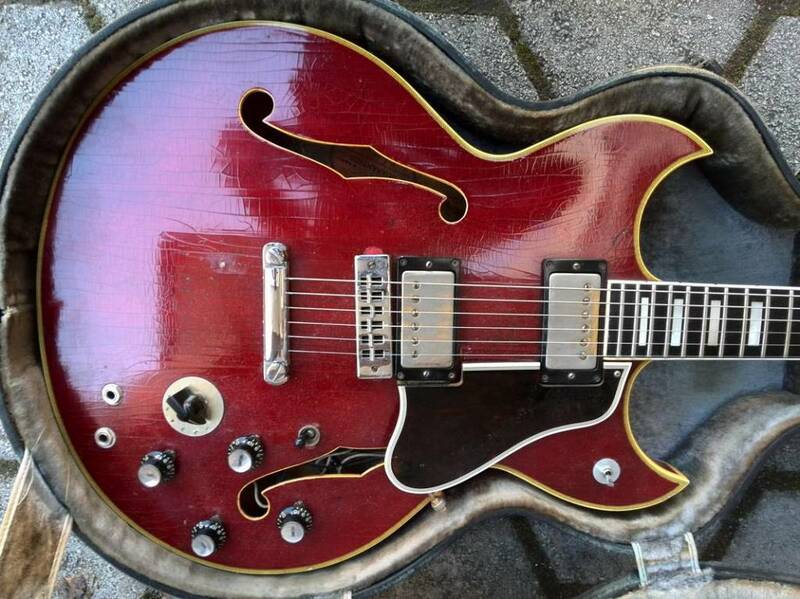 I’ve seen 69 ES-340’s like this but this is new to me. Plenty of 68 features that don’t exist on the later ones. The custom made plate isn’t factory and I took off the witch hat knobs (because they’re ugly). I’ll be the first to admit that I don’t know everything about these guitars. I am frequently surprised by the evolution (and long downhill slide) of these guitars. The guitar pictured above is a somewhat modified ES-335 from 1968. I’ve never seen one quite like this. There are ES-340’s that were brought to market in 1969 that had birch plywood bodies and maple necks. They can be very attractive and are decent guitars even if the circuit is a little wacky. What I didn’t know is that there were ES-335’s released in 1968 that had the same birch bodies and the same multi piece maple necks. Birch is pretty similar looking to maple. The grain is a bit more assertive and there is generally no figuring beyond the grain. It makes for a pretty attractive blonde guitar. When I saw this guitar (which I now own), I just assumed it was a 69 ES-340 that had been erroneously given a 335 sticker (and that it was a 69). I had seen a 340 with a 335 label before and figured this was just another. 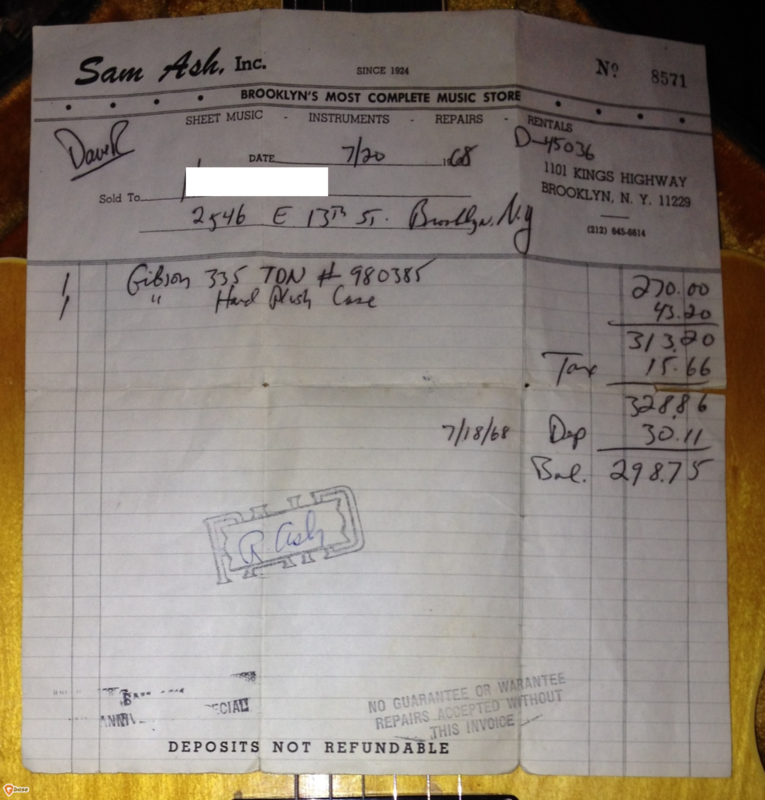 Except that the owner had the original sales receipt and it was dated July 1968. That’s proof enough that 68 birch 335’s with maple necks exist. This one also has the dot in the “i” in the Gibson logo which most, if not all ES-340’s are missing unless they have the later “pantograph” logo. It also has the factory hang tag that states that it is a 335TDN with the word “birch” following the model name. If I’m recalling correctly, the first mention of a birch guitar is in the 1969 catalog and it’s only the ES-340 that gets the birch mention. It’s also interesting that my usual sources for Gibson serial numbers don’t show 980xxx anywhere. We know by the sales receipt that it can’t be later than mid 68. So what is this? Prototype? I don’t think this is a special order but it may be a prototype or the very first run of guitars in this birch body/maple neck configuration. I had a ES-330 like this but it was a 69 but at least that shows that guitars other than 340’s got this neck and body. It’s not that unusual that there is no mention in the 68 catalog since Gibson made mid year changes pretty frequently and they would simply show up in the following year’s catalog. But the 69 and 70 catalogs show that the 335 was offered in sunburst, cherry and walnut. No blonde. The ES-340 is shown in blonde and offered in walnut. Gibson certainly could have been experimenting with the new materials and later selling them. The fact that they came out with the 340 in the next year hints at that. 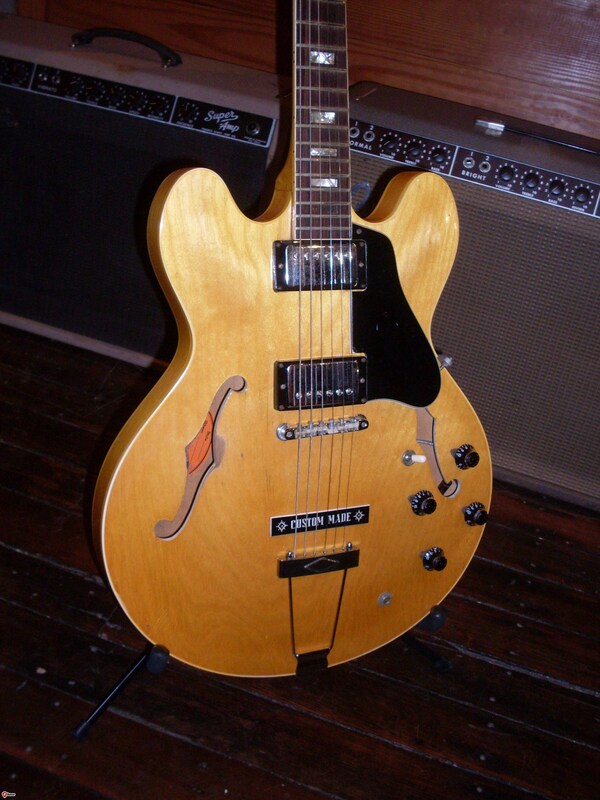 It’s also relevant that ES-340’s in blonde, while not plentiful, are far from rare. You can usually find two or three at any time on Ebay. I checked all the 69 340’s out there (maybe 5 or 6 right now) and none have the dotted “i” in the Gibson logo. I have looked at a few and none had the long tenon that this one has (although I haven’t looked at many that closely). It’s unfortunate that so many mods were made to this guitar. The only one that is irreversible is that some nitwit added a stop tail (which is fine) but put it way too low. He must have had the same luthier as Larry Carlton. There it is in stunning black and white. 68 ES-335TDN. And not even late 68. I don’t know how long it took for guitars to get from Kalamazoo to Brooklyn but I’m guessing this guitar was made weeks or even months earlier. Sold it pretty cheap too. I remember (I’m really old) 335’s being closer to $400 by then. I know, I couldn’t afford one. I’ll Have Mine Rare, Please. 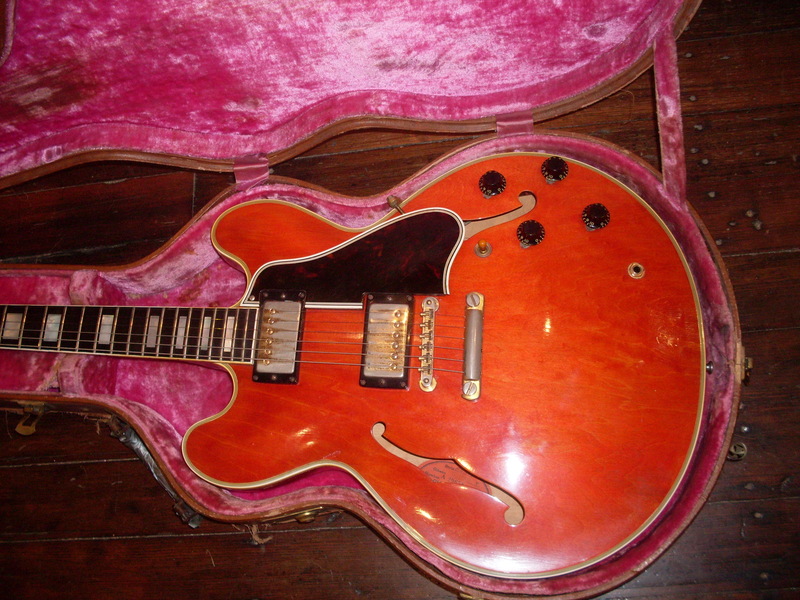 This is a one off ’63 ES-355 with Venetian cutaways. Even if it wasn’t heavily modded, I don’t think this guitar would command a serious premium over a stock 355. Nobody is thinking “…gee, I wish they had made these with pointy cutaways like a Barney Kessel. The vintage guitar market is a strange place (have I mentioned this before?). I can have a one of a kind or “one off” and nobody will care if it isn’t a popular model. I posted a photo of a heavily modded but probably unique ES-355 with pointy (Florentine) cutaways like a Barney Kessel. I was asked by the owner what I thought it was worth and I really couldn’t say because I have no basis for comparison and I didn’t really think anyone would be that interested in it. This is partly due to the mods but also partly due to the oddity of it (it looks a little strange to my eye). I recently bought a blonde 61 Byrdland. they made only 20 of them which makes it rarer than a 58 blonde dot neck by a lot (there are 50 of them). But Byrdlands aren’t all that popular so there isn’t much added value for a rare blonde one. There just aren’t enough buyers. So when does rare actually matter? When the non rare version of a guitar is popular, generally the rarer version of it is worth more. Sometimes a lot more. Blonde 335’s are worth double what a sunburst is worth. There are perhaps four times as many sunbursts as blondes from 58-60. Blonde 345’s are so rare that they are valued at as much as 5 times what a sunburst 345 is worth. It’s actually very hard to put a value on them because they come up for sale so infrequently. I know of stop tail blonde 59 ES-345’s that have sold from $45K to reputedly more than $80K. There’s a black ES-345 for sale at over $90K. I’m not sure the seller will get it for a Bigsby 59 in black but you never know if some rock star or Wall Street master of the universe might just really, really want one. Of course on sold on Ebay for $22K recently, so I’m thinking $90K might be a little ambitious. But it will certainly command a premium over a sunburst-no doubt about it. There are plenty of folks out there who can afford these guitars. 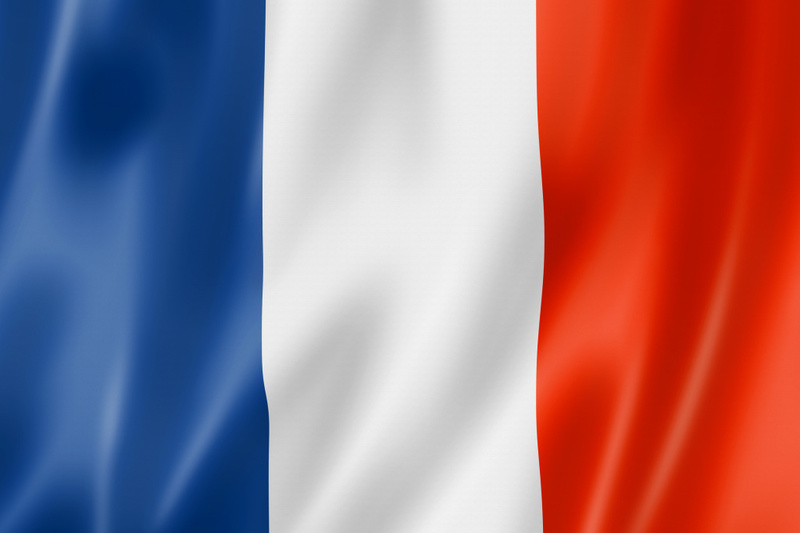 Whether they will pay that kind of premium is hard to predict. Today, I bought a very rare guitar. It is the only stop tail mono 1959 ES-355 that I know of. There certainly could be another out there – I know there’s a 63, a 61 and two 60’s. I had a stereo 59 stop tail not long ago but I always felt that a mono 59 stop was a holy grail guitar. Is this one of the rare ones that commands a premium? I can tell you this-every mono 59 Bigsby 59 ES-355 I get goes out the door in a matter of days. They are very desirable and not easy to come by. So, what is a mono 1959 355 stop tail worth? Well, the premium of mono over stereo is around 30%. The premium for a stop over a Bigsby for a 335 is around 20% but stop tail 335s are common. I think double the value of a mono Bigsby 59 is pretty close. Add in a premium for double white sealed PAFs and what you get is a very valuable guitar. Recently, a blonde 59 ES-355 surfaced and was offered to me. It was a stereo Bigsby version and it supposedly sold to a well known collector for more than a blonde 335 would go for. And why not. It’s not like they made very many of them. I know of two from 59. I didn’t sell it so I really don’t know how much it sold for. I do know what the asking price was and it was way up there. The larger point is that popularity trumps rarity every time. If I had a 59 Les Paul Burst that someone had special ordered with a double cutaway, I don’t think the world would be beating down my door with offers well in excess of the usual 59 Les Paul. Just because it’s rare (or unique), that doesn’t make it more desirable than the one everybody wants. But if it’s a popular model and the custom elements don’t make it into a “different” guitar (like the Florentine 355), then you could be looking at a serious premium. Conversely to the top photo-plenty of folks have wondered why Gibson didn’t make stop tail 355’s. The Gibson logbook shows at least four stop tail 355’s in 1959 but it doesn’t differentiate between mono and stereo. I’ve owned one of the stereos and now I have what could be the only stop tail mono 59.